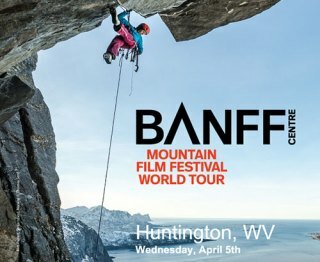 Organizers have announced the lineup of films that will be shown by the Banff Mountain Film Festival World Tour when it comes to Huntington at 7 p.m. Wednesday, April 5, at the Keith-Albee Performing Arts Center. The 2016/2017 World Tour features an exhilarating and provocative collection of films that explore the mountain world, highlighting new landscapes and remote cultures, and exposes audiences to exciting adventures and adrenaline-packed sports. The world tour is being co-sponsored in Huntington by the Marshall Artists Series and the Marshall Recreation Center. For tickets and information, contact the Marshall Artists Series by phone at 304-696-6656. For local information, please contact Chad Steen at the Marshall Recreation Center by e-mail at steenc@marshall.edu or by phone at 304-696-4653. Immediately following the Banff Mountain Film and Book Festival, held annually in November in Banff, Alberta, Canada, a selection of the top films submitted to the Festival go on a tour around the world. Host organizations in each tour location help to choose a program that reflects the interests of their community, creating a unique celebration of adventure and adventurers at each stop. The World Tour spans the globe, reaching over 430,000 audience members. Banff Centre for Arts and Creativity is a learning organization built upon an extraordinary legacy of excellence in artistic and creative development. What started as a single course in drama has grown to become the global organization leading in arts, culture and creativity across dozens of disciplines. From our home in the stunning Canadian Rocky Mountains, Banff Centre for Arts and Creativity aims to inspire everyone who attends our campus – artists, leaders and thinkers – to unleash their creative potential.